The normal heart beat is triggered by the coordinated, sequential flow of electrical impulses through specialised conduction pathways to all parts of the heart. Activation of his electrical system causes heart muscle contractions which is the basis of its pumping function. A problem anywhere along these electrical pathways may cause an arrhythmia, or heart rhythm disturbance. By accurately diagnosing the precise cause of an arrhythmia, it is possible to select the best possible treatment. While electrocardiograms (ECGs) are important tests of the heart’s electrical system, they are brief tests that record only the events that occur while the tests are running. Apart from atrial fibrillation, arrhythmias are rarely incessant or continuous over many hours, which makes it unlikely that a routine ECG will always capture the underlying electrical pathway problem. Even tests that stretch over longer time lengths, such as Holter monitoring, may not capture an event. If a patient presents to an Emergency Department or doctor’s office during an episode of arrhythmia an ECG may capture important information but still may not give a complete diagnosis. During an EP study, a specially trained cardiologist (“Electrophysiologist”) will test the heart’s normal electrical pathways and look for abnormal pathways. The testing will usually also attempt to provoke suspected arrhythmias and collect data about the underlying mechanisms during actual events. As a result, EP studies can help locate the specific areas of heart tissue that give rise to the abnormal electrical impulses that cause arrhythmias. This detailed information provides valuable diagnostic and, therefore, treatment information. EP studies most often are recommended for patients with symptoms indicative of heart rhythm disorders or for people who may be suspected of being at risk for Sudden Cardiac Death. There are many variations to the components of an EP study depending on the problem being investigated. Therefore, the details of an individual procedure are the subject of face-to-face discussion between the patient and their treating Electrophysiologist. While ECGs are non-invasive tests, an EP study is moderately invasive. In adults the study is performed using local anaesthesia (to numb the skin overlying the veins that are accessed for catheter placement) and intravenous sedation to keep the patient relaxed and sleepy. In children the procedure is performed under full general anaesthesia. The procedure involves inserting one or more electrode-catheters (“catheter”) – a long, very thin, flexible, bundle of wires coated in a plastic sleeve – into a vein, often through a site in the groin or neck or below the collar bone, and passing the catheter up into the heart. 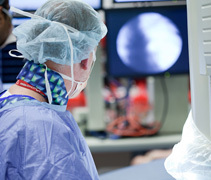 The position of the catheter is monitored by “fluoroscopy”, a special type of x-ray that provides continuous, images of the catheter as it is passed through the veins to the heart. Once the catheter reaches the heart, electrodes at its tip pick up the heart muscle’s electrical activity and a variety of measurements are made. These measurements can localise the faulty pathway responsible for the arrhythmia. During this “electrical mapping”, the electrophysiologist may induce, through “pacing” (the delivery of tiny electrical impulses through the catheter to the heart muscle), some of the very arrhythmias that are the crux of the problem. The events are safe as they occur in a closely monitored and controlled environment and are necessary to ensure the precise location of the problematic tissue. Based on this data, as well as information gathered and decisions made before the study, the electrophysiologist may proceed on to perform an “ablation” to permanently remove the abnormal pathway in an attempt to cure the arrythmia. If an ablation is not performed, the information obtained during the EP study useful for diagnosis and guide treatment of the arrythmia. During the procedure, sedated patients rarely report pain, but any discomfort is assessed and appropriate measures are taken to provide relief. Some watch the procedure on monitors and occasionally ask questions. Others sleep. The procedure usually takes about two hours. 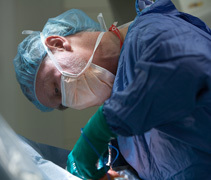 The patient remains still for four to six hours afterward to ensure the entry point incision begins to heal properly. Once mobile again, patients may feel stiff and achy for a day or two. Since potentially dangerous arrhythmias are provoked during an EP study, it’s crucial that specialized staff are present to handle all situations. An electrophysiologist, with advanced training in the diagnosis and treatment of heart rhythm problems, performs the EP study. The electrophysiologist leads a team of specially trained cardiac technologists and nurses, who assist during the procedure. 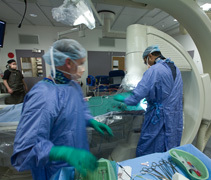 The team performs the EP study in an electrophysiology laboratory, or EP lab, a well-equipped, controlled clinical environment located within a hospital with other advanced cardiac facilities. As a result, the test is quite safe and complications are rare.